We’d been talking back and forth with Katelyn and it just so happened that we would be able to meet up with these two in Charleston, SC while we were on our trip in Florida. After the 22 hour trek from Florida to Plattsburgh, a five hour ride to Charleston was like a walk in the park. So it was set, we were going to get to visit the gorgeous city of Charleston, meeting up with Katelyn + Stephen and be able to document it all. 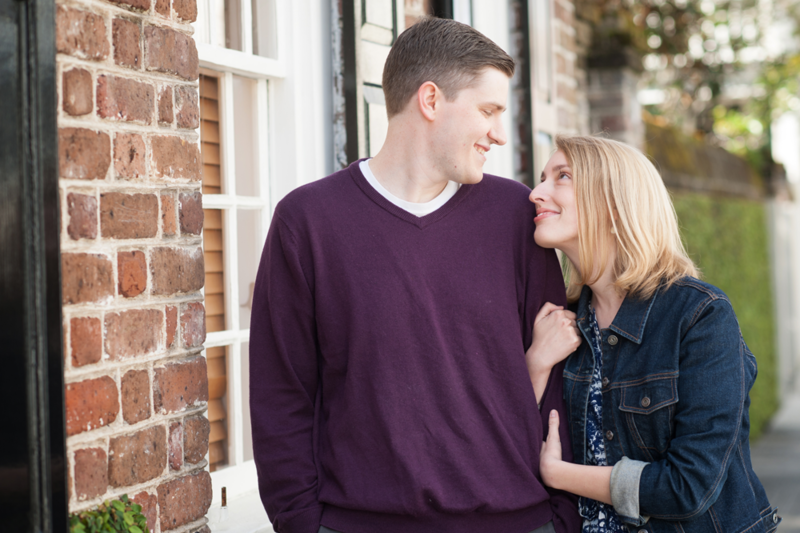 We new from the get go that their session was going to be a blast from the text Katelyn sent right before we met up: “We will be the really smiley couple with dirty blond hair!” These two were absolutely adorable right from the start. 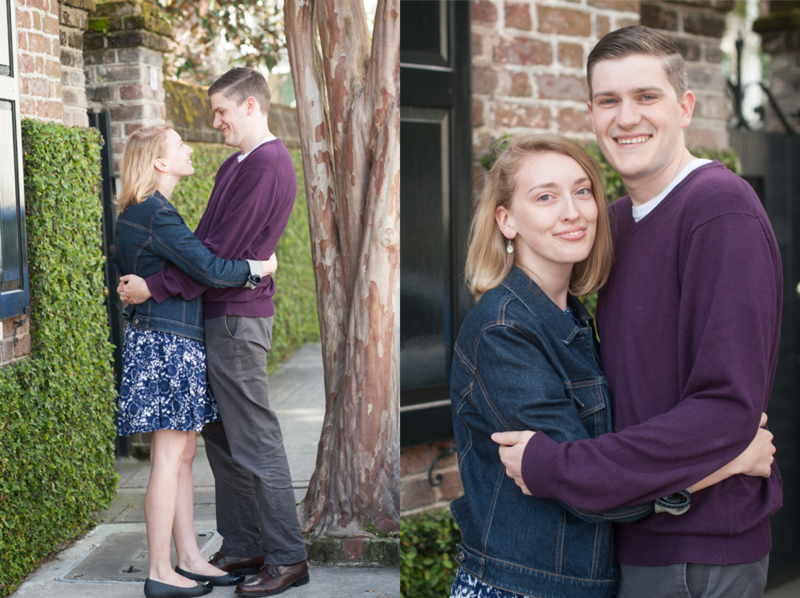 Take a look at some of our favorites from there session as we made our way through the historic district of Charleston! 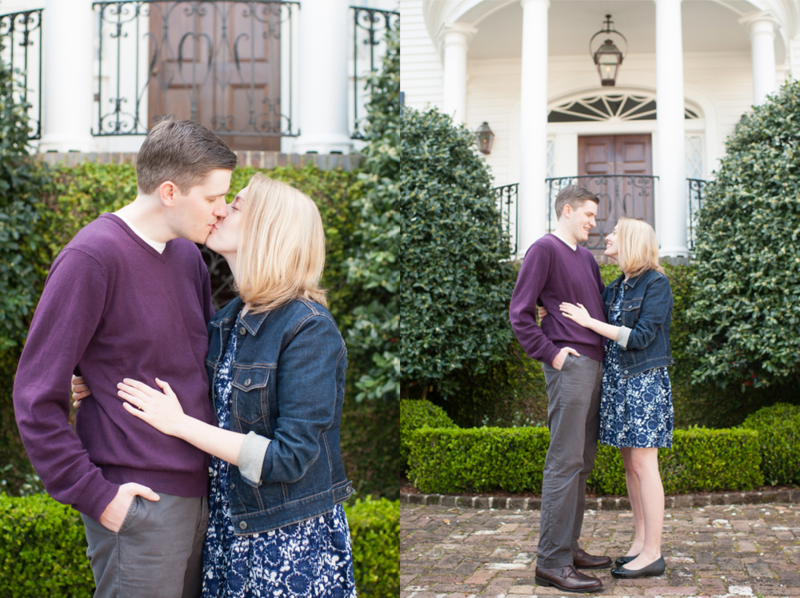 Did we mention that the houses in downtown Charleston are quite possible the most amazing anywhere! We love to joke around with our couples and have them whisper fun secrets during posing. Well, Stephen’s idea of “sweet nothings” were a bit different then most. As we moved in closer we heard complex pharmaceutical chemical names. And shortly after we learned that we had some scholars on our hands! Let’s just say there are a few degrees already in this future family! Good Lord, the Charleston architecture! And the color! A big change from the varying shades of grey we’ve had for a few months now! One of our absolute faves! So as you take a look at this awesome ring below, we have to tell you how amazing Katelyn and Stephen’s friends are. But a little backstory… This ring is just a place holder for the engagement ring that one of their friends had designed and forged for Katelyn. And, the reason for the place holder…their friend is designing her custom wedding ring to fit perfectly with the engagement ring. But better yet, one of their other friends designed this ring! I mean, come on, how cool is that! And then we got the local insight to a great beach super close to Katelyn and Stephen’s house. Thank you guys for such an amazing time! We can’t wait for your wedding! Rob Healey - I may be biased, but such a cute couple. Great photo shoot !! Tracy DeCoste - Beautiful photos of two special people in one of the most beautiful cities. We tried and tried, a few times actually, to get out with this amazing couple for their Get to Know You session and mother nature just wasn’t having it. Finally, we were able to head up to Point au Roche in October and we had a blast. It was a chilly and windy one, but we managed to steer clear, at least for a little while! We felt adventurous and headed on over to the water. Fortunately the wind wasn’t heading out way! Love this little red building! I think we found the wind! So we headed back to the cars and jokingly said: “A few on the swings?” Then figured, what the heck! And ended up with this adorable gem! We had so much fun with these two and can’t wait until there wedding this summer! Thanks so much for sticking it our with us in the crazy wind! We couldn’t be happier to be Jamie and Jason’s wedding photographers! In case you didn’t know, we were one of the first to know of their engagement. Well, us and about 120 others people. Jason popped the question with encouragement from Taylor and Andrew, Jamie’s brother and sister-in-law, at their wedding! It was an amazing moment toward the end of the night, when Taylor’s bouquet seemed destined to make it’s way only into Jamie’s hands. Your have to click over, if not just to see Jamie’s reaction! Needless to say, she said yes and now here we are getting to shoot their Get to Know You session at Point Au Roche State Park! We had so much fun with these two last fall. Take a peak at our favorites from their session! Can’t wait until July to get to spend more time with these two on their wedding day! Oh, if only every Monday morning started this way! This was the first proposal that we’ve ever photographed and while there were a lot of moving parts, it was pulled off seamlessly! Various flight delays couldn’t stop this from happening and I’m so honored to have been there to capture it all. The first and most crucial step was Cassie putting on the headphones, to which she began to hear Ryan’s voice, telling her all the things he loves about her. The images do a much better job at telling the story then I can, so I’ll leave you to enjoy these amazing moments. First I have to admit we are absolute suckers for First Looks! We always try to explain them as best be can to our brides, but somehow I feel like I often come up short, and don’t do them justice. So I figured what better post to start with than the topic of First Looks. So let me try to elaborate a bit, and let our couples’ images fill in some of the blanks. At the simplest level, a “first look” is when the Bride and Groom see each other prior to the ceremony, share a private moment together and have an opportunity to take more portraits. We create some time before your ceremony and find a perfect spot, tucked away from all the hustle and bustle. I am almost always bringing our Grooms to the location and setting him up to await his bride. I love this part, because you can just feel the anticipation and the emotions rising. As we wait, Debbie brings our Bride along, and as the moment begins we slowly step away and capture what unfolds. Now let me just say, that just barely scratches the surface of what we believe a first look really is. Because it truly is so much more. But before I go on, I’d love to share a bit from our wedding day. Now, honestly, I wouldn’t change a thing, not even getting up at 4:30 in the morning to setup our reception tables with my Father-In-Law. But, if we could go back, the one thing we would have done was create more space in our timeline before our ceremony. Why? Because if we had, I know we wouldn’t have thought twice about doing a first look! I need to get real now. I was so overcome with emotion, that I balled like a baby when I saw Debbie walking down the aisle. And, maybe, for about 5 more minutes after that. And I’m pretty sure later in the ceremony. Here’s a few from our wedding day. We really should have made Debbie’s walk up to me much shorter! That was quite the wait. But seriously, can you blame me! How absolutely gorgeous is she, and how lucky am I! But honestly, even if I knew there was mild ridicule in store for me from my friends and Uncle Mike, I know that even with a First Look, it wouldn’t have happened any other way. I was marrying the love of my life and nothing would have changed that feeling. But I do know it would have been perfect if I could have shared a moment like that with Debbie, just her and I, alone. I could have gotten to hold her and try to put to words how gorgeous she is and how much she means to me. Because, once she headed down the aisle, our wedding was in full swing, and a private moment like that would be hard to find. Now, I think it goes with out saying that I think that is the best part of First Looks. Yes, it does offer so much more, but really the most paramount is that private moment you share. Alone. Together. It’s that chance for him to see you and actually express how much he loves you. To hold you in his arms. It’s an opportunity to calm the nerves, and really a chance for you both to soak it all in. But I must go on, because certainly the benefits don’t end there. A First Look also allows you to extend your wedding day. And that means many things! We’ve helped you plan ahead. You’ve factored it into your timeline. And now you have plenty of time before your ceremony. Time for you to share together. To not feel rushed. To have a relaxed opportunity to soak in all the emotion. Time to have fun with your bridal party. Time for us to capture you both together. And maybe time to even knock out those ever-important Family Portraits. And by getting a chance to doing some, or all of those things, it carries over to the rest of your day. You can chat with guests after your ceremony. We can go slowly, so you don’t feel rushed during your “Newlywed Portraits”. You’ll get to spend more time with guests. So no one will be sitting around their table thinking “Boy I’m hungry. I hope the photographers wrap it up soon!” And hopefully you’ll just feel so much more relaxed, and are able to just live in the moment. And because we’ve extended your day, you’ll have more images, because we’ve created more moments, more opportunities to capture you two! More moments to look back on. More portraits to pick from; that will adorn the walls of your home for a lifetime. Now I just want to say, we are excited to share your day with you regardless of whether you decide to have a first look or not. We know that it’s not for everyone, and above all else, we want you to enjoy your day as much as possible. We just hope that we’ve given you enough to think about so that it’s less about breaking an old tradition and more about creating new moments for you both to share! So, hopefully I’ve done justice to what First Looks have to offer.